The Michigan DOT TAMP is available here. 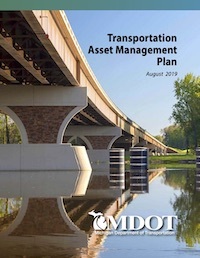 The Michigan DOT TAMP describes the asset management processes by which Michigan DOT makes its program and project decisions. The TAMP also includes inventory and condition information, a description of investment strategies, and financial and performance gap analyses based on four pavement investment strategies outlined in federal guidance. Those investment strategies are (1) achieve the national goals, (2) preserve the condition of the pavement and bridge assets, (3) achieve and sustain a desired State of Good Repair, and (4) constrained investment. This document includes the following sections: Asset Valuation, Financial Plan, Introduction, Inventory and Condition, Investment Strategies, Lifecycle Management, Objectives and Measures, Performance Assessment, Risk Management.